(MTHTBA) Volunteers for the nonprofit Clark Fork Coalition often find themselves in the mud, fishing out litter from the river’s banks or restoring riparian areas. 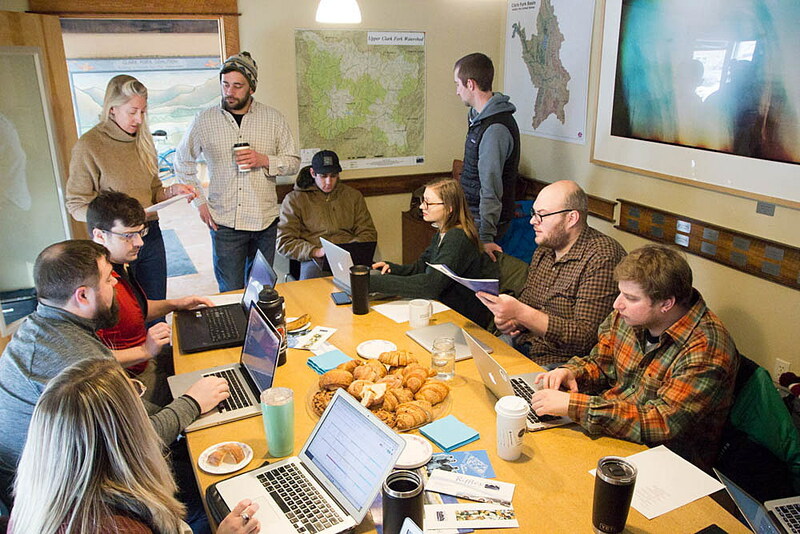 But on February 20, 17 employees from digital marketing and software-as-a-service company, TOMIS, armed with laptops instead of waders, crowded into conference rooms, stood at counters and tucked into corners of CFC’s Missoula office to tackle a different issue: digital marketing strategies. Holly Biehl, CFC outreach and marketing director, said it was fun to see how easily and naturally the tech team divided into subgroups and found space to work among wading equipment and boating gear. Biehl worked with Ryan Frank, TOMIS marketing manager, to set up the volunteer day and working through any follow-up steps. Frank said TOMIS is uniquely situated to help nonprofits optimize their online marketing efforts to increase visibility, donations, volunteers and more. The volunteer day was the first of what CEO and founder Evan Tipton hopes will become regular TOMIS Growthathons. Increasing their community involvement is just one way TOMIS is anticipating to grow this year. Tipton said the company recently launched a new SaaS product, completed a seed round, and anticipates hiring new team members in 2019. With bachelor’s and master’s degrees in tourism management from the University of Montana, Evan Tipton has more than 10 years of experience in the outdoor tourism industry. The tours and activities sector is the fastest growing segment of the global travel industry, Tipton said, projected to be more than $180 billion market by 2020, but it’s largely underserved by software companies. After spending several years in Silicon Valley helping start a SaaS travel startup and going through Stanford’s business accelerator program, Tipton returned to Missoula to found TOMIS (Tour Operator Marketing Intelligence Software), a marketing intelligence and automation platform for small- and medium-sized niche outdoor tour and experience operators. In 2018, TOMIS was named a High Growth Company to Watch. TOMIS automates marketing processes and analyzes data, making personalized recommendations for how to reach new customers. The agency serves a number of Montana companies, such as Grizzly Hackle and Glacier Raft Company, as well as clients from all over the world. Last month, TOMIS closed a deal with HomeStake Venture Partners, bringing their seed round to $800,000, and welcomed Jeff Batton from HomeStake to their Board of Directors. Tipton said he’s excited to have investment from both Montana investors and TOMIS clients as the company prepares to build out their SaaS team. After folding Tipton’s past marketing agency into TOMIS, the company still offers managed marketing services. 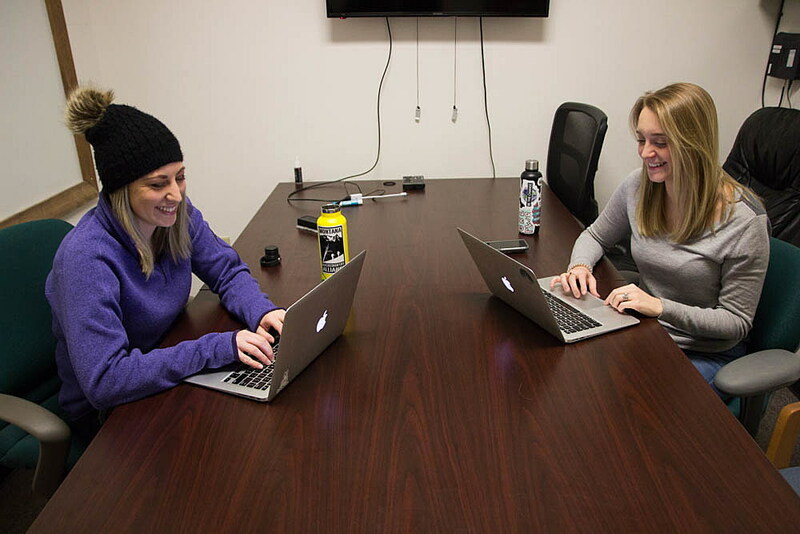 One of the company’s local hires, Marketing Manager Ivy Duncan, works with companies to help improve their digital marketing performance. One company she works with is Riverlife, an Australian tour company with about 20 different services. Duncan said one of the first projects the TOMIS team did with Riverlife was rebuilding the company’s website. According to a 30-day report, revenue increased 119 percent after the new website launched, and online transactions increased 77 percent. Reworking a company’s website is just the beginning, Duncan said. It builds a foundation for future marketing campaigns, such as social media marketing, Google Ads, and email campaigns. Originally from Deer Lodge, Duncan got a degree in business administration and marketing from the University of Montana. After graduation, a friend encouraged her to apply for the small tech startup about a year ago. Part of what Duncan likes about working at TOMIS is the startup mindset. TOMIS has also produced a new AI ChatBot for websites, designed to automatically answer common questions in real-time from customers. Greg Robinson, lead data scientist, said the tours and activities sector can present a unique challenge in digital marketing because the expertise is often localized and niche. Robinson said hotels and airlines are on the cutting-edge of automatically optimizing ads, especially predicting behavior based on factors like time of day and year, historical behavior, and even the weather. For an outdoor rafting service, a tool that can automatically adjust the amount of money spent on advertising can be a game-changer. “If it’s Tuesday, and the forecast for Saturday’s rainy and cold, we don’t want to be spending money that day on Google ads and Facebook ads because people aren’t going to book anyways,” Robinson said. Robison added that knowing what other activities are going on in an area and how far in advance people book experiences helps inform how TOMIS’ clients can best spend their money and helps the automated software make predictions about optimizing a marketing budget. Robinson said TOMIS is also working on building a data science warehouse in which to test new algorithms, such as a script that can automatically adjust advertising bids based on a weather forecast. TOMIS is housed in two workspaces in a former FBI office in downtown Missoula. The handcuff bar on the wall of Robinson’s office is in stark contrast to the distinct stained glass windows in the other workspace. But in either office, you’re sure to find a dog. One of them is Robinson’s. Robinson was grateful to find a job in Montana that could pull him and his pet out of San Diego. He’d visited friends in Missoula for years but never imagined he’d find a tech job that would match his interest and skills in the place he came to ski. “I still feel like I hit the lotto by getting to be data scientist for a really cool industry and live in the Zoo,” Robinson said. 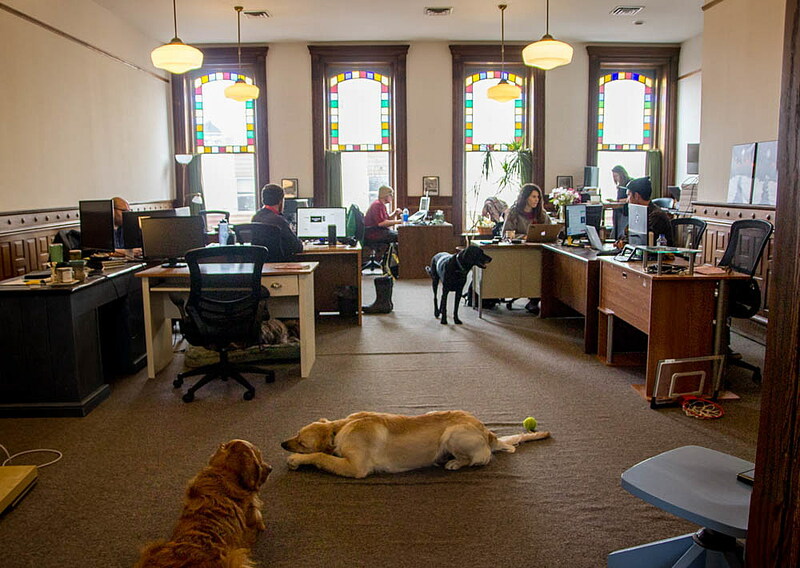 In addition to dogs and data scientists, there are also a couple of interns in the TOMIS office. One of Robinson’s is a business grad student from the University of Montana that he’s hoping to hire upon graduation. Robinson said TOMIS works to maintain their good relationship with the university. As TOMIS continues to expand SaaS operations, they’ll also be hiring new team members. To find TOMIS jobs, visit our jobs board or TOMIS’ website. Katy Spence is the communications director for the Montana High Tech Business Alliance. She worked previously with the Missoula Current and Treesource, and has an environmental journalism master’s degree from the University of Montana.